For those into Chinese boxing and weapons systems here's a site written by Paul Brennan that translates into English an impressive collection of original Chinese works by various authors dated from 1875 to 1963 on Taiji, Shaolin, Xingyiquan, among other arts. Texts include sections on self-defense, saber training, pushing-hands techniques, fitness, diet and philosophy. If you gather energy into your chest, you will gasp and it will not stay for long. If you gather energy into your lower abdomen, it will stay long and not hinder your breathing. It will accumulate gradually until it is abundant. This kind of energy is vast, and is more readily led by the intent. Explanations and illustrations appear throughout on form and function as well as the differences between internal and external theory. 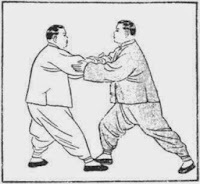 Many of these works emphasize the unity of mind, body and spirit along with encouraging the would-be aspirant to cultivate a proper attitude and moral integrity in relation to the martial arts.